This is going to be an eventful week for AE. We have invited Mr. Roy Gregory (Founder and editor of Hi Fi Plus in the UK and ex VP Marketing of Nordost in the US) to visit Hong Kong. We invited him to "review the playback quality of AE showrooms". Such approach is very different from reviewing any single piece of electronic. 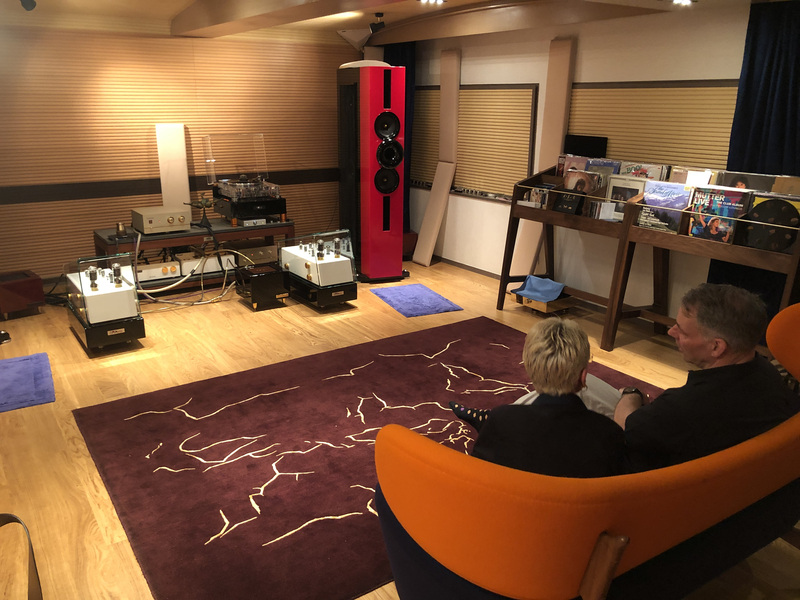 Managing the playback quality of a showroom requires a holistic understanding of room acoustics, speaker placement, and configuration of electricity etc. It is in our opinion the industry lacks articles of such interest at the retailer level. The priority is to share and explore techniques to achieve better sound. And AE shall remain humble to learn from leading critic like Mr. Gregory. This is the way going forward to break new ground and to curate more incumbents. We shall share whatever we learn during the course of this week. 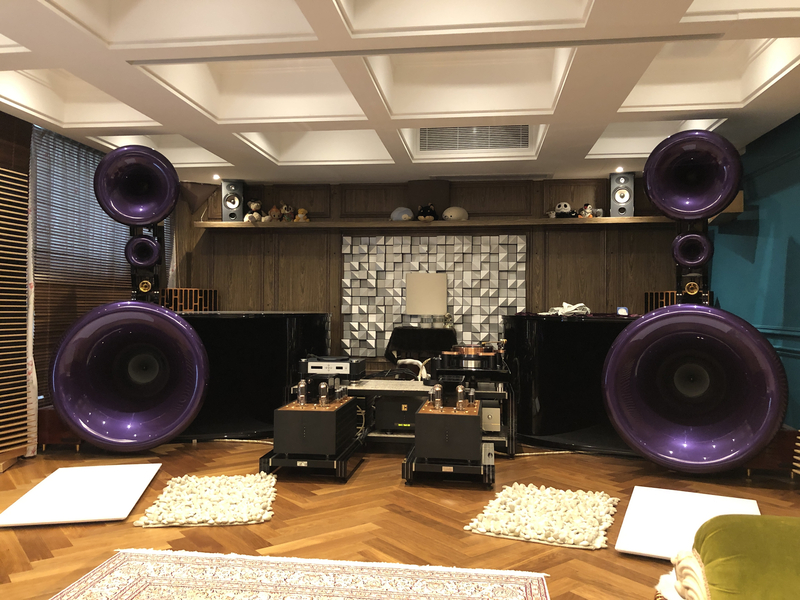 Last but not least, Javier of Wadax will launch the 100kg extreme reference dac in her finest sculptural form together with Roy Gregory at Divin Lab on April 13. Javier is likely to broadcast the event live. Stay tuned for more info from AE face book or forum. This is great! After a bit of a hiatus on this forum, this is indeed an uplifting development. Novel idea! Say hello for me and shall meet this funny chap at Munich. By the way, please prepare some Prokofiev heavy stuff for auditioning. He is a frequent classical music goer and know who plays well and who don’t. A genuine music lover with wealth of experiences in music. He is not a sound guy. He is a music guy. What a move! New direction is indeed needed. Evaluation by Roy began this morning. He is damn good. 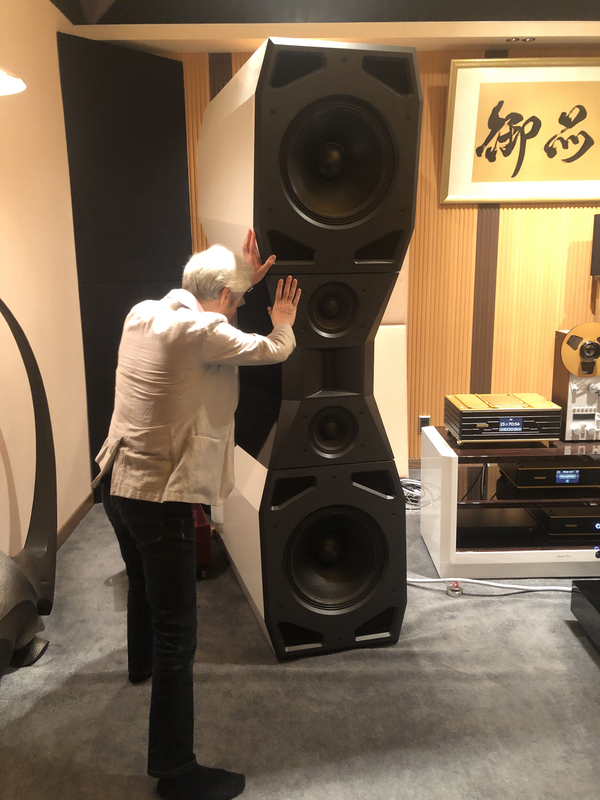 After listening to his own record, he suggested to tilt up the left channel of the Firebird to improve image rigidity, mid range energy and the liveliness of the experience. 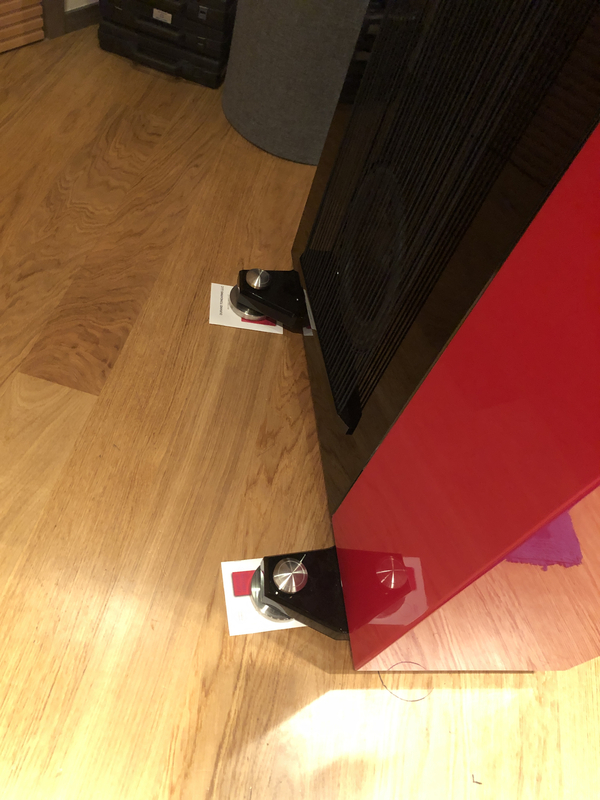 Because the speakers are too heavy for us to adjust the feet, so Roy inserted some cards underneath only the left channel. He grasped the system character very fast and already know how to make it better. I wonder how did he spot the issue. He told me bass energy coming out from the left hand of the pianist (Benedetti Michelangeli) is not solid enough. Indeed, after the change, the focus of energy is back (it was relatively diffused before). Vocal has more chest. Fluidity improves notably. We rarely adjust speakers this way. Learn something new today. 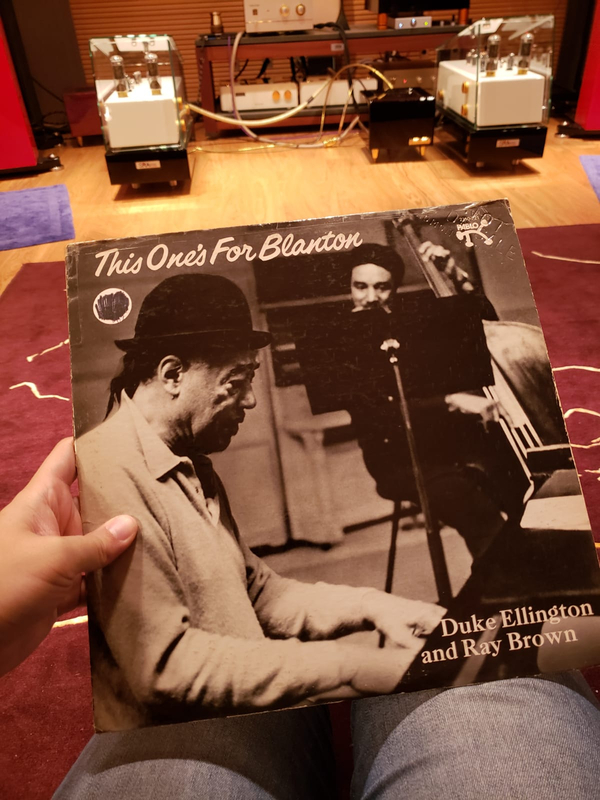 When Roy was playing this LP yesterday, he commented the last octave of double bass lacks the grip and resolution. The power is not there. This album is one of his references for testing. I have to say that his ears are damn good. Two days ago, the active subwoofer of the right channel of Firebird was out of order. I couldn’t switch it on because the DSP chip was broken according to my technician. I was very frustrated. My technician worked overnight but couldn’t fix it. I called Ralph and discussed with Master Chik. They both said crossing at 60hz shouldn’t be a problem because people can’t really tell. Besides, I have one sub that is working. I didn’t tell Roy one of the active sub was out of order. As of now, he still dose not know. But his ear could detect last octave of double bass lacks power and resolution. Roy and Louise spent 2.5 hours on AE Sheung Wan trying to understand the AE way of things. He is not a “sound guy”. He always thinks and answers from music perspective. I rarely heard him say something like mid range is beautiful/enticing. For instance, I asked him if you found the system is very quiet. His reply was “Chris what does quietness mean?” I answered “silence between notes”. Then he said, “yes it is all there”. I asked him if the tonal balance is right. In his view, tonal balance is not the most difficult to achieve. For instance, a violin playing inside room A always sounds different than the same violin playing in room B. But you always know it is still a violin regardless of room A and B. His priority is “timing of music”. That is the most difficult to get it right. He focuses on phrasing of the pianist/cellist/violinist, the communication between the performer and the orchestra, alongside the tempo of different instrumental groups serving the unity of symphonic goals. At the end of the auditioning, I asked him how does AE Sheung Wan perform. He could tell enormous room acoustics effort behind it because the dimension of the room is almost a square 22 feet x 20 feet x 8 feet (His answers always reference to objective facts). He could enjoy most music that he tested here except one album I mentioned previously. There are some DG albums that must be auditioned with the right curve. He agrees the “pictorial playback quality” of the Sound of Music by Frederica von Stade. His wife Louise also enjoyed very much on the playback of Maria Joao Pires. In conclusion, he said this system get the electronics and speakers out of the way for most music. His real aim is to experience the Divin Lab which we will visit Friday. Today we shall visit Roman, one of my platinum customers. PT, you are doing something very good for the industry. You dare to expose criticisms without fear. I brought Roy to visit Roman this morning. He even bought the current residential flat just to house the Beethoven by Cessaro. After a brief introduction of his system to Roy, the listening session began with the digital front end. Once again, Roy is not the type who describes sound like most of us. There was no mentioning of inadequate bass extension, aggressive highs and warm/lean mid range etc. Some of his testing records are chosen on the basis of performance quality than recording quality. His perspective always stems from mechanics of the orchestration and techniques of performer. He is an avid classical music lover and constantly attend live concert in London and rest of Europe. He really knows the musical background of his recordings inside out. One of the CDs that Roy played was the first movement of Tchaikovsky Violin Concerto Number 1 by a Georgian female violinist. Roy commented the system radiates the emotions of the violinist straight through to the listeners. I sat on the right hand side corner of the room most of the time. I could hear so much control on the bow and the subsequent radiation of energy. I got a slight feeling of listening to Kogan. That was captivating. The learning part began when Roy took out a testing/set up disc to gauge the continuity/completeness of soundstage in this system. Track 15 of this test disc begins with Cha Cha swinging from the left channel to the right channel. Roy discovered the sound of Cha Cha was broken somewhere in the middle position. He explained to us that the broken section was actually due to ceiling reflections. He suggested to place two speakers slightly closer to each other, maybe an inch or half an inch. But this is a gigantic horn! Then Roman morphed into HULK mode to push both channels towards each other by half an inch at most. This scene really confirms his seriousness. Then we played the same track again. But Roy stopped after 2 seconds because we had forgotten to put back 1st reflection points treatment on both sides. Then he played again. The ceiling reflections were gone. The sound of Cha Cha swings continuously from the left channel to the right channel without any broken passages. This test illustrates there is a tool to set up soundstage objectively instead of following perception of seeking an ever expanding stage. It has to be continuous. This setup disc was complied by him during his days at Nordost. We all learnt something new today. Now I understand why he could spot the bass energy on the left hand of pianist at AE Sheung Wan was not focus enough. The physical size of the piano spans a few feet stretching across the two speakers. The discontinuity on the left yesterday is analogous to the broken soundstage in the middle today. The difference was he tilted up the left channel yesterday due to absence of reflections from ceiling at AE Sheung Wan. Today at the home of Roman, the strategy was to push the speakers closer to each other, just by so little, to mitigate ceiling reflections. Roy requested Roman to warm up the Miyajima Madake Snakewood for 30 minutes before listening critically. He always cleans up static on vinyl before playing. (He never uses remote to chose track on CD because it does not sound as good as choosing manually.) He played Benedetti Michelangeli performing Beethoven Piano Concerto No.1 for a starter. He stopped playing after a few minutes. In his opinion, the orchestration lacked the dramatic tension in spite of beautiful tone rendered by the Italian pianist. I suggested to lower the gain on the Robert Koda Takumi MC One from 70db to 64db. We played again. It was better. Congestion in the mid range lessened. Still, Roy felt the tempo of the orchestra was a bit slow. It should be more dramatic. The gradual buildup of tension should be more apparent making musical sense. Then he played the Sibelius Violin Concerto to verify but the tempo was still a bit slow. It wasn’t the case when he was listening to digital. Roy wanted to find out why. Then he began testing the speed with the Dalby record weight on. It was a tiny bit slow. He adjusted. Then he levelled the Hartvig Statement to be absolutely precise. We then listened again. It was obvious to him now the mechanics of orchestration under the baton of this conductor performing Sibelius is a lot more clear than before. Locations of different instrumental groups were more locked-on than before. Roy was always in action. He is keen to help Roman to bring up the performance of his analog setup. Before we went to lunch, he concluded the Madake Snakewood is suitable for vocal and smaller scale music. 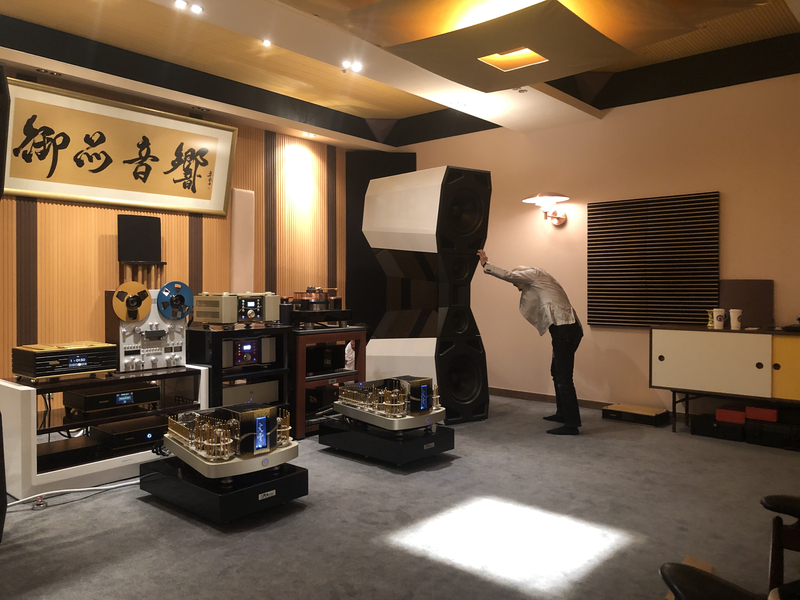 Roman is the first ever audiophile in Greater China to have an very in-depth exchange session with Roy. We had a great time listening straight for 3.5 hours. Roman brought all of us for a nice lunch at the Gold Coast Hotel. The conversation during lunch was all about music and setup techniques. Roman is such a serious, passionate, and knowledgeable audiophile. Thank you once again. After playing a few CDs at Divin Lab, Roy found the speed of the system is not fast enough. He quickly pointed out that I had not adjusted speaker position after installation of the Zanden bass traps. But the Divin is almost a ton per channel! Roy insisted we must push the speakers forward by half an inch. Then this was what happened next. JLam and RG pushing at the back with shoulder, and Yamada in front making sure they didn’t over push it. Last week, I am honoured to have Roy paying visit to my system twice. I think Chris had already written a very detailed story about the first visit. Hence, I would focus on the content of his second visit. Roy evaluates a system by musical perspective. He does not talk in audiophile language. He inspired me to dive into the details of music before serious evaluation of a system. He certainly enlightened me. 1. Do you feel the music is played by humans? 2. Do you feel you are in the same space with the performers? It sounds quite vague and difficult to understand for me. He expounded to me by the DG recording with Michelangeli playing Beethoven Piano Concerto Number 1 conducted by Giulini. With a balanced system, one should be able to feel the orchestra in under good command of the conductor. He would hold them back in the first few passages and gradually build up the drama before exploding into crescendo. Different instrumental group interacted smoothly with each other as tempos varied. The performing signature of Giulini and Michelangeli is reproduced clearly. I could feel Giulini was creating linear tension gradually and elegantly, while the left hand of Michelangeli was conversing with his right hand. The flow of music was so smooth without obscuring the bass notes on left. Luckily my digital front-end play up to the standard of Roy. But he could detect some passages were beautified, particularly on a small live vocal performance recording, which should sound unpolished. Roy didn’t know I was using a new interconnect with a smoothing characteristic. He could immediately notify this character in my system! However, my analogue frontend did not sound balanced to his ears. Therefore, he wanted to revisit to help unleashing the true potentials of my beasts. He commented my Madake Snakewood cartridge is very beautiful in the mid but not comprehensive enough to play large pieces. Based on his understanding of the Thales Statement arm, he adjusted the VTA, azimuth, the tracking force, and the tracking weight alongside re-levelling the turntable. I was listening to Martzy before he came, and she sounded mellow and soft. After his tuning, Martzy played like a great virtuoso with unbelievable strength. I could feel incredible passion from her bowing techniques. In many cases, we audiophiles love to tune all music to the direction of sweet and warm mid range without knowing the musical backgrounds of different performances. Once the system is well balanced, different music should reveal very different characters. One can then be emotionally connected with the performers easily. He also demonstrated the Fuuga cartridge in my system. Compared to Snakewood, it has much richer bass and treble, with a lot more energy, filling up the whole room with music. This demo shows me why people need to keep a few cartridges and even tonearms! 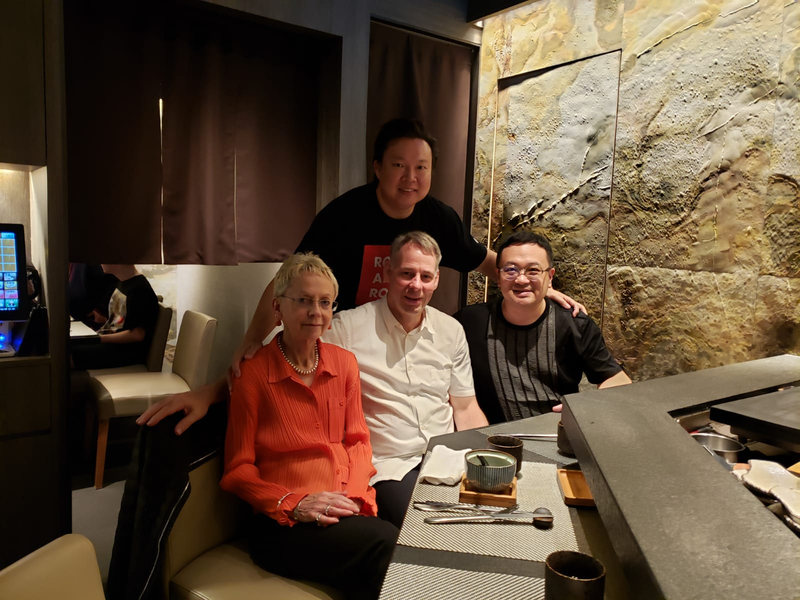 Thank you Chris for inviting Roy to Hong Kong it’s a nice beginning for us to connect with global audiophile world!